The Unique and very Special Mosaic cube with our Original -Twin 4 Axis core. Special Price Still only US$ 42.00 Pre-Order yours Now. Once again, we have teamed up with Oskar Van Deventer to bring you another beautiful puzzle. 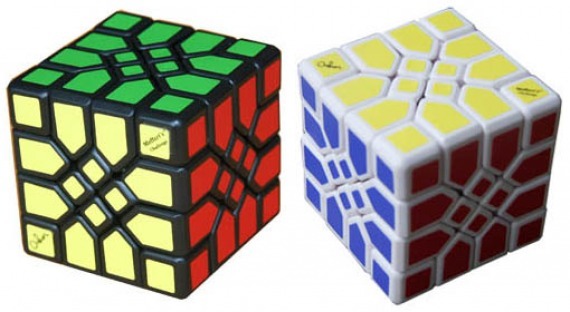 The Mosaic cube is a different twist on puzzling than we have ever brought you before. This puzzle makes simply stunning designs, and is a challenge to solve. Unlike any other puzzle we have produced before, it has a completely new core with eight arms connecting each of the corners. This allows for rotations never before seen in any of our previously released puzzles. The mosaic cube has been a long time in production. It is finally at the best quality we can make it. This puzzle has undergone five different prototyping’s and debugging. It has had two complete sets of moulds made for it. It has been in the production process for over seven months now. It is not as smooth turning as what you have come to expect from Mefferts puzzles. Rather than destroy the moulds and abandon this project, we have decided to release it FIRST to Jade club members. This puzzle is a collectors puzzle. Whilst not suitable for speed cubing similar to our Pyraminx Crystal by Aleh (which became one of our best limited edition selling puzzles) this is not to say it is not playable. It is! You can view it in action here: www.YouTube.com. It is just not made to be turned rapidly and it does not cut corners. This is a beautiful puzzle to behold. It will be initially offered through the Jade Club. Once these have been available for XDAYS I will then release them through my website to the general public. This is a very difficult and costly to produce puzzle, I am saying is a collectors puzzle because we now have no plans to produce it again.